I had worked on restorations of antique cars, carriages and wagons before I ever worked on a fire engine. I had a sense of how horse drawn and early motor vehicles were striped. I was amazed at the amount of decoration that was on that first steamer. Every surface had at least a 23 karat gold stripe... with an outline. Why had the volunteer firemen requested so much gold and busy decorations? Who did all this intricate hand painting? I've been asking these questions for years, and finding surprising stories of people and art and service. 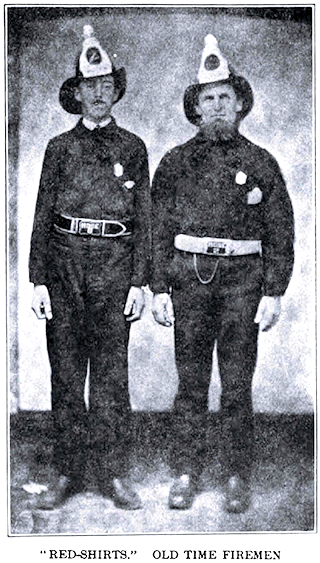 The hat to the right was worn in parades by a volunteer fire fighter in the early 1800's. Each fire company had an emblem or motto on their hats and engine. 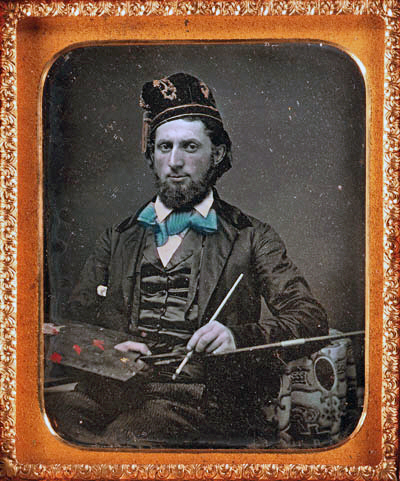 Sometimes, portrait artists were hired to do oil paintings on parade hats and engines. Thomas Sully, John Trumbull, John Archibald Woodside and David Rent Etter all painted portraits for fire companies. Less than half the fire engines in America before 1830 were red. Red shirts were popular way before red engines. The generation that defeated the Red Coats chose to wear bright red shirts as firemen. "I can think of no more stirring symbol of man's humanity to man than a fire engine." 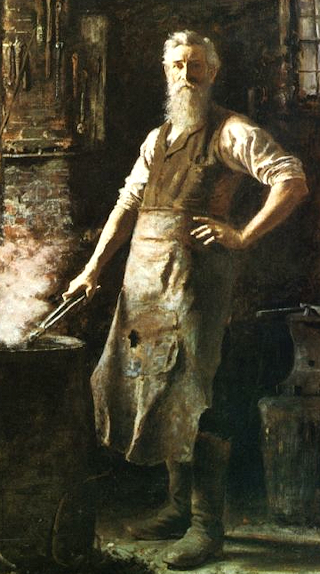 In early America artisans were a large part of the population. They lived at the beginning of the industrial revolution when technology was still hand powered. Artisans were independent makers of things sold locally. They organized their lives around their family. Most of them lived within walking distance of their shop. They had a special skill learned through apprenticeship. Their new-gained freedom was inspiring their lives. They were concerned and active in town proceedings. America was the most literate country in the world in the early 1800s. Firemen and artisans were tasting the new gained freedoms of America. Fire companies were a model to the local citizens of the new America. Many of the founding fathers became interested in this Second Fight; they fought against fire as well as tyranny. The fire company was a metaphor and a model and an experiment in self rule. 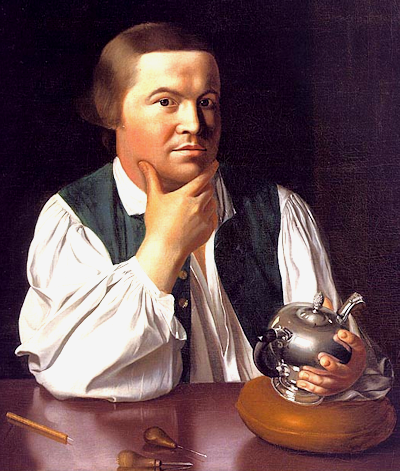 Paul Revere combined being a Boston fire warden with a career as a silver smith. In later generations other artisans were employed to create silver presentation trumpets, lanterns and even silver statues affixed to parade vehicles. 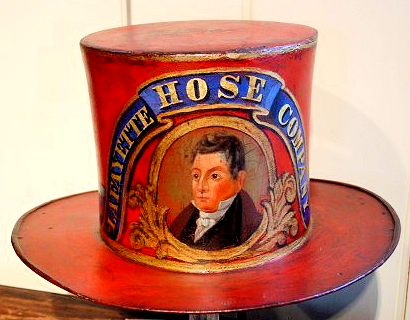 Revere's example as a citizen and also his style of ornament influenced the fire service for generations. 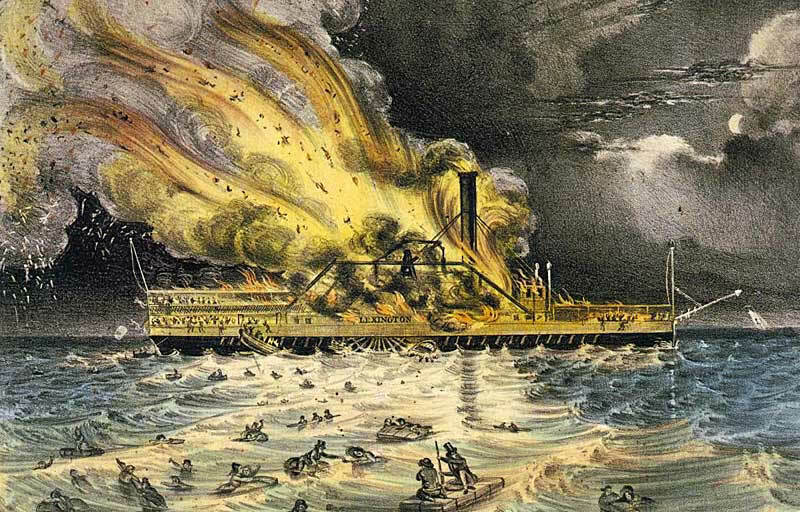 Nathaniel Currier was a freelance artist and firefighter. His life changed when he documented a tragic ferry fire that he witnessed in New York harbor. He sold the illustration to a newspaper and soon found success drawing scenes of other New York fires. With Mr. Ives he built a company that produced prints of American scenes. 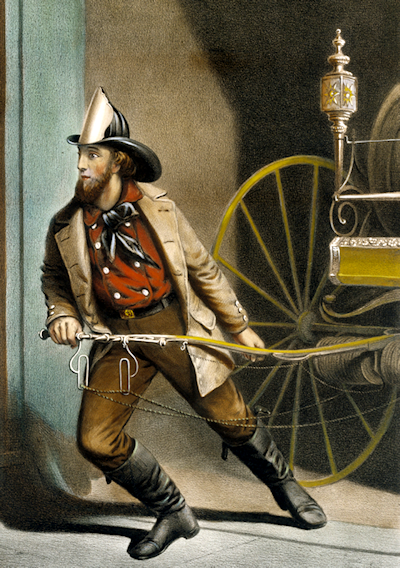 Their series of prints "the Life of a Fireman" decorated many fire house walls. 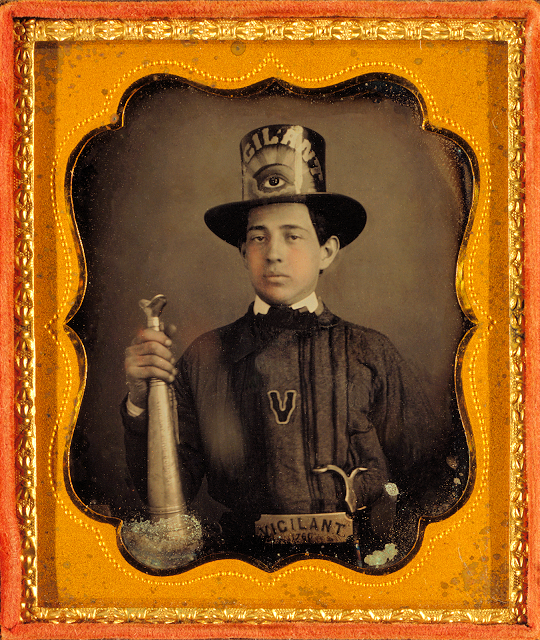 Sometimes he included himself as a firefighter in the lithographs. Here he is majestically pulling a hose carriage out of the fire house. Here we have an apprentice at a factory painting stripes on wheels. There are stations set up for nine more painters. 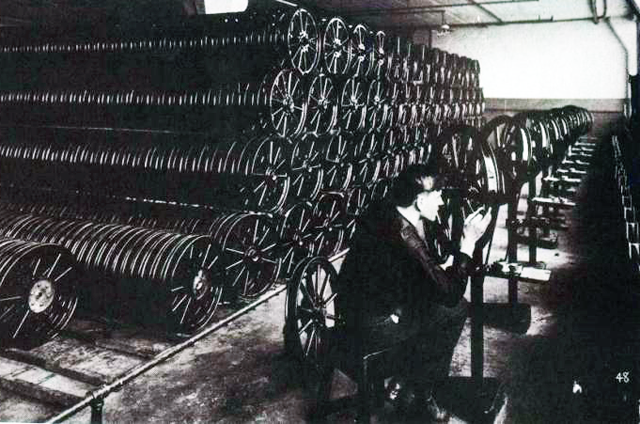 All early motor vehicle wheels were pin-striped, just like all coach and carriage wheels had been. Stripes were just an expected part of a fire engine, or a Model-T. A vehicle with no stripes was a repainted vehicle. This is the paint shop at the Seagrave factory. The two men on the left are painting scenes in oil paint on engine hoods. The two on the right are adding gold decorations and stripes to a seat and a gas tank. Below is an example of their combined work on a 1921 engine. With my restorations I am trying to keep this art alive and remembered. In the 19th century every town with a few thousand people had a paint shop or wagon shop with a "fancy painter". Each artisan had his unique arsenal of skills and styles. When the town's engine was to be repainted, the firemen chose the best local painter for the job, and they expected his best work. The repaints were often just a beautiful as the original paint jobs, perhaps in a more up-to-date style. The status of the engine in town demanded the finest craftsmanship possible. Many other artisans, besides fancy painters, were hired by fire companies and engine builders. Their work is bold, skillful and confident. Each artisan showed off their talents to the public through their finest work. Shaving mugs were gilded just like the engines. 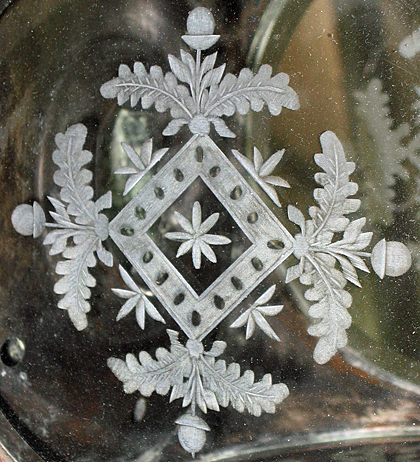 Glass etching and cutting, as seen on lanterns, is now almost a lost skill.